It is becoming a tradition for me to receive a beautiful James Cheshire and Oliver Uberti coffee table book for my birthday. A couple of years ago it was The Information Capital, this year it was Where the Animals Go. 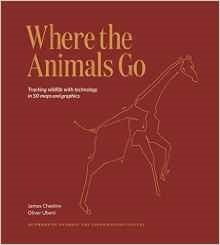 Where the Animals Go is a collection of stories and visualisations all relating to the tracking of animals, each story occupies at most a few pages and is accompanied by a couple of maps which trace the paths of one or more of the species in question across the earth. The maps are beautiful. The book starts with an introduction which covers the evolution of animal tracking technology. The bulk tracking of the movement of animals on an hourly or faster basis has become easier with the advent of commodity GPS devices since the 1990s. Some of these raw data are now being published on aggregation websites such as Movebank. Precursors to these GPS tracking systems are old-fashioned bird-ringing – a passive technique which relies on recapture of animals and has been around since the early 19th century. The Argos system relies on data from tags being transmitted to a small constellation of satellites – it has lower temporary and spatial resolution than GPS. There are also radio and acoustic tracking methods which have been around from the sixties. In the text we discover how ants have been tracked in an artificial nest using tiny bar codes, and Daphnia zooplankton have been tracked with fluorescent nanoparticles in a tiny aquarium. Penguin colonies have been identified, and numbers estimated, from satellite imagery of the guano (posh word for poo) that they stand amidst. I must admit to being a bit of an enthusiast for tracking myself, particularly when out skiing or walking. I used use GPS to geotag my photographs – parenthood has put a stop to such pursuits. I started using GPS about 10 years ago when the process was a bit clunky both in terms of the hardware and the software to process tracks. Nowadays I can record a GPS track on my watch or a mobile phone. So I can easily see how advances in technology relate to advances in the study of animal movement with GPS sensors becoming feasible for ever smaller animals. After introducing the technology there are then three parts covering animals on the land, in the water and in the air. The tracks of troops of baboons seemed most similar to the tracks of my Alpine skiing holidays. In this study a number of baboons from the same troop were tracked, this made it possible to see something of the leadership, or otherwise, behaviour of the baboons but this is actually unusual – in most cases a small number of individuals from a group are tracked. Most entertaining are the tracks of animals who have been relocated for human convenience, and promptly return to the place from whence they came – pythons and crocodiles are in this group. Sadly, I suspect this type of behaviour does not end well for the animals concerned. Related to this are those animals who live in close proximity to humans and find their why blocked by major highways, mountain lions in California – for example. Animal tracking can show the degree to which major highways cause a problem, and also show the way to solutions in providing corridors. Sometimes tracking clears animals of what humans consider to be mis-deeds – the tracking, by acoustic sensors, of sharks in Hawaii falls into this category. More benignly it has been discovered that oilbirds in Venezuela did not simply foray out of their nesting caves at night and return at dawn, thus failing to carry out vital ecosystem services such as dispersing seeds. Instead GPS tracking showed that they spent days out in the forest foraging, and roosting in trees. Generally the animals portrayed are depicted moving in a plane (mathematically speaking) across the land but sometimes they break out into the third dimension – an example is vultures spiralling upwards on thermals. Hang-gliding friends I know would be interested in this. Also included are the bar-headed geese, who migrate across the Himalayas, it turns out they generally stick to the lowest altitudes they can get away with, however they still exhibit great endurance in high altitude flying. The accompanying text provides detail on what we see in the maps, and also some human interest in the scientists who collected the data. Another beautiful book, and the references are sufficient for you to go and find out more about any of the individual stories. There is a dedicated website where you can see excerpts of Where the Animals Go.